What different glass etching techniques are there? All of the possible visual effects you can achieve by abrasive blasting on glass can be broken down into 3 major techniques: surface etching, carving and shading. Surface etching: So named because you are only etching the surface of the glass. In addition, this type of etching is all done in one stage of blasting, which means that the designs produced are all 2 element designs. That is, all the designs are positive and negative, or black and white. The etched portions of the design almost always look white, and the clear, unetched portions of the design look black or dark. All etched elements have to be separated by spaces of unetched glass, or the etched elements blend together as a single silhouette, with no detail inside the border. Surface etching is the easiest technique to learn and the fastest way to produce a finished etching on glass. The etched designs aren't as sophisticated as those from carving or shading. 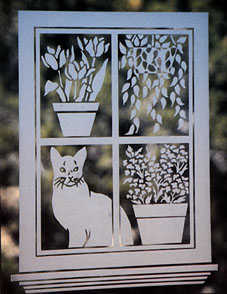 Carving: Called carving because you actually blast, or carve, deep into the glass, giving a three dimensional etching. There are several types of carving, including single stage, two stage, multi-stage, and freehand carving. Single stage carving is simply blasting a surface etching design deeply into the glass, separating elements with clear spaces, as in surface etching. With two stage or multi-stage carving, the resist is removed, not all at once, but a few elements at a time and in a definite sequence. This way, elements can be carved to different depths than the other elements they touch, yielding a 3-D bas relief carving. But not a regular bas relief, a reverse bas relief - since you are carving from one side of the glass and viewing the finished carving from the opposite (smooth) side! In other words, you are carving a hollow (or negative) shape in the glass that looks solid and positive from the smooth side. Elements of a two stage or multi-stage carving design do not have to be separated from each other as they do in surface etching, because they are removed at different times and blasted to different depths. These different depths are what give the necessary visual separation between elements. A combination of multi-stage shading and multi-stage carving is used in this piece. The shading is obvious because the elements are different shades of gray, especially where they touch. 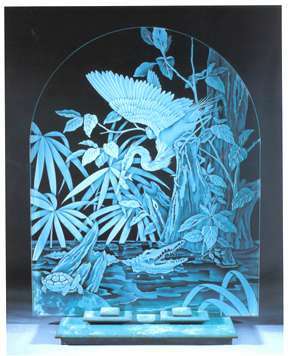 (Design and execution by Heather Mathews, Heather Glass; from Glass Etching: Techniques & Designs, used by permission of the publisher) Shading: Like surface etching, this technique just blasts the surface of the glass. But unlike surface etching, the elements in the design are blasted to different apparent shades of gray (hence the name Shading), rather than to the solid white color produced in surface etching. The principle of shading is that 100% clear glass usually appears dark while full surface etching appears 100% white. So you can create shades of gray by etching the surface to a density less than 100%, and you control the shade by controlling the density. Shading, like carving, can be done in one stage, two stage, multi-stage, and freehand techniques. Elements of the shading design can all touch, as they can with a carving design, because the visual separations between elements are created by the stage blasting process. 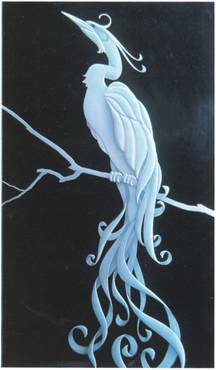 In shading, this gives different shades of gray where elements touch rather than different depths as in carving. Shaded etching looks very much like airbrushing, with flowing tones of light and dark indicating shape and contour. Combinations of techniques: Any etching can be produced with just one technique, but also by a combination of two or all three techniques. For glass etchers who know all three techniques, this gives the ability to do the best and most sophisticated etchings possible. It is the ability to use each technique for its strengths and avoid its weaknesses. You can also get beautiful results by combining etching with other glassworking techniques, like stained glass, glass blowing, etc.